Act (VC) 1/Turn: [Choose 1 face-down “Dimensional Robo Commander-Admiral, Final Daimax” in your G Zone, flip it face-up] If you have a “Dimensional Robo” Heart Card, during that turn, this Unit gains Power+10000, and, if there are 2 or more face-up cards in your G Zone, Critical+1, and, if there are 4 or more face-up cards in your G Zone, all of your front row “Dimensional Robo” Units gain Power+5000/Critical+1. Act (RC): [Choose 4 of your “Dimension Police” Rear-guards, Place them into the Soul] If you have a Grade 3 “Dimensional Robo” Vanguard, choose up to 1 face-down “Dimensional Robo” card from your G Zone, [Stride] it to (VC). Auto: [Soul Blast 1 – card with 5000 or more Power] When this Unit is placed on (GC), you can pay the cost. If you pay it, during that battle, this Unit gains Shield+10000. And, if a card was placed in your Damage Zone during this turn, during that battle, this Unit gains Shield+5000. “Dimensional Robo Commander-Admiral, Final Daimax” is a G Unit with an explosively flashy ability. When your Heart Card is a “Dimensional Robo”, it first gains 10000 Power, then if there’s 2 or more face-up cards in your G Zone, it gains Critical+1, and if there’s 4 cards, all of your front-row “Dimensional Robo” Units all gain Power+5000 & Critical+1! If there are 4 or more face-up cards in your G Zone, it becomes a marvelous attacker with 3 Criticals and 15000 Power. And all of your Rear-guards gain a Critical, applying incredible pressure on the opponent. This is a card you can easily rely on to be a game-deciding trump card. Also in “We Are!!! 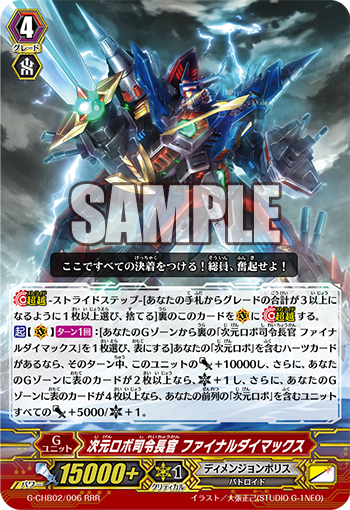 Trinity Dragon” is “Dimensional Robo, Dailesson” who gains Power based on the number of face-up “Dimensional Robo” in your G Zone, making it an excellent card to use in tandem with “Final Daimax”. “Dimensional Robo, Daihawk” is a First Vanguard, who regardless of your opponent’s Grade, allows you to Stride during the Main Phase. If you havre a Grade 3 “Dimensional Robo” as your Vanguard, you can place 4 of your Rear-guard “Dimensional Robo” into the Soul, to let you Stride a “Dimensional Robo”! By using it with “Dimensional Robo, Kaiser Grader”, you can potentially Stride as soon as your 2nd Turn. If your opponent is a Grade 2 or lower Vanguard, you can still Stride! “Gallant Incarnation, G-O-Five” is a G Guardian who lets you Soul Blast a 5000 or higher Power card to gain Shield+10000. And if a card has been placed in the Damage Zone this turn, during that battle, it gains an additional Shield+5000. So take damage from an opponent’s Rear-guard to protect yourself from the attack of the Vanguard! By guarding with a 30000 Shield, you’ll have an iron clad defense! The Character Booster “We Are!!! Trinity Dragon” has many cards that supports 《Dimension Police》’s 【Burst】. Be sure to check out future information!